Ms. Nezu, the magnet coordinator for both PAM and NMA, has united the students together showing the great skills that they have accomplished. The school worried about the safety when students rode the bus, therefore they intoroduced their film about the bus safety rules that one must remember to follow when riding. Ms. Nezu introduced the winners of the NMA films that had an outstanding remark on the film represented. The first group to present their films showed how the US Government wanted to defund the Planned Parenthood for various reasons, including the fact that the new president has been demanding it to be shut down. They have used real sources from CNN to prove their point of how congress wants to defund the program. The second film introduced the students that are in the program of Music Foward Foundation. “The Sound of Unity”, the name of the film, showed how students are widely involved in such musical programs that famous artist have come and visited them to help them. The PAM students introduced a sneak peek to their new show in a couple of months. It contained a new type of dance created by Mrs. Goldshein. 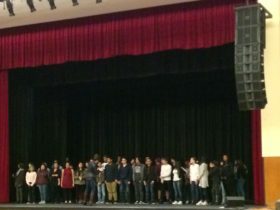 The new choir teacher had her students perform a sneak peek for their upcoming show that will be performed later on.